On 23–24 March, VfL headed to Brighton to exhibit at VegfestUK, an annual event celebrating veganism at a few different locations throughout the UK. 2019 took Brighton into its 11th year of VegfestUK, showcasing around 230 stalls with an array of vegan products from food, to clothing, to art. This year also saw VfL return to VegfestUK, curating and hosting the Mature Zone – a place to escape the hustle and bustle of the main event and enjoy a ‘pay-as-you-feel’ hot drink or snack. The Mature Zone featured several exciting activites throughout the weekend, including talks hosted by VfL’s Chief Executive, Amanda Woodvine, and cookery demos from Cookery & Training Outreach Coordinator, Ellie Murphy. With a separate seating area away from the main exhibition area, the Mature Zone offered a friendly and welcoming atmosphere for vegans and the vegan-curious to come and meet like-minded people, or even just take a break between visiting stalls. At 2pm on the Saturday however the area became increasingly busier, because word had spread about VfL’s vegan cheese-tasting party. 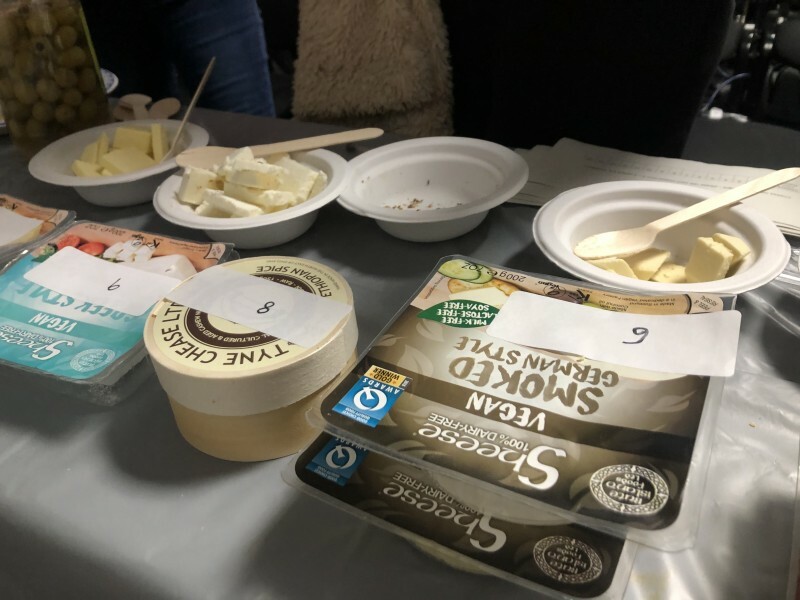 Offering a selection of vegan cheeses to sample, visitors were given a chance to try 14 varieties from Bute Island and the Tyne Chease company, with each being invited to score their samples from low to high. One thing was certain – vegan cheese is very popular! After everyone had chance to enjoy the food and have a chat about which was their favourite, the scores were counted. It was a close call, but the fabulous ‘Smoked German Style' flavour from Bute Island came out on top by just a couple of points' difference. Of the Tyne Chease samples, their 'Ethiopian Spice' flavour topped the poll. Later that day as things were winding down, VfL staff had a chance to catch up with visitors during the afternoon snack party, tucking into some delicious Eat Real hummus chips and Perkier bars. The second day proved just as successful with another chance to socialise during the older vegans' discussion group. Although taking place in the Mature Zone, the discussion group was open to anyone, and brought a diverse range of age groups together to discuss everything ‘vegan’. This was followed by a chance to find love during the Mature Veg*ns speed dating session, before the afternoon wound down and visitors were invited along to the Mature Zone to enjoy a tipple, courtesy of the Black Isle Brewing Company. All in all the weekend was a huge success and it was great to meet vegans from all walks of life and be able to talk to them about VfL, what we do, and how we can help. Bute Island ‘Sheese’: Cheddar Style with Jalapeno & Chili, Cheddar Style with Caramelised Red Onion, Smoked German Style, Greek Style, Gouda Style, Red Leicester Style, Edam Style, Mature Cheddar Style and Mild Cheddar Style. Tyne Chease: Truffle, Smoked, Garlic, Tyne Original and Ethiopian Spice. Stockans: Mini Oatcakes, Orkney Thin & Orkney Thick Oatcakes. Perkier Bars: Coconut & Chia, Cacao & Cashew and Peanut. Eat Real: Sea Salt Lentil Chips, Kale Tomato & Spinach Veggie Straws, Sun Dried Tomato & Roasted Garlic Quinoa Chips, Sour Cream & Chives Hummus Chips. Black Isle Brewery: Goldfinch, Blonde, Porter and Red Kite. Do public authorities have a duty to supply vegan food?